Elon Musk and SpaceX have announced that Japanese entrepreneur and billionaire Yusaku Maezawa will be the company’s first Moon tourist. Last week, SpaceX unveiled its plans to send two passengers aboard a rocket on a trip around the Moon. The company didn’t disclose any names at the time, but a tweet by owner Elon Musk hinted that one of the passengers may be Japanese. 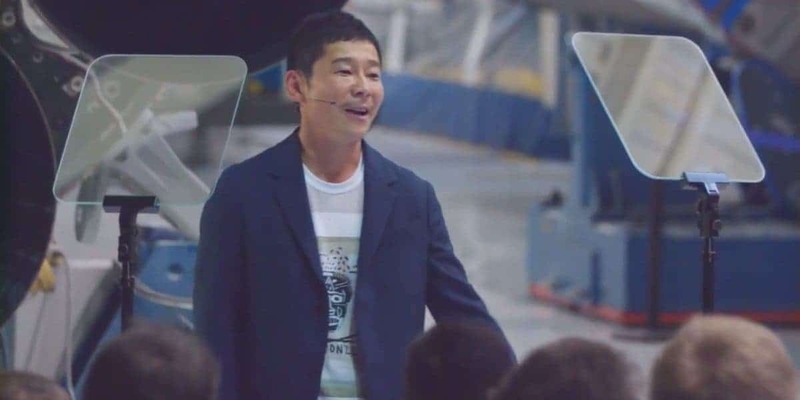 That hint was spot-on: Yusaku Maezawa, a Japanese entrepreneur and billionaire, has purchased all the seats on the Big Falcon Rocket’s (BFR) first crewed flight. Maezawa, a known and enthusiastic art collector, plans to embark with six to eight artists, which will accompany him around the Earth’s natural satellite. The artists have not yet been chosen, but the billionaire hopes they will include a musician, sculptor, painter, film director, dancer, photographer, architect, novelist, and fashion designer. Part of the project — which Maezawa christened #dearMoon — will involve them creating work inspired by their journey after they return to Earth. “One day when I was staring at his painting, I thought, ‘What if Basquiat had gone to space and had seen the Moon – what wonderful masterpiece would he have created?” Maezawa said, referring to a 1982 painting by Jean-Michel Basquiat he bought last year. “If you should hear from me, please say yes and accept my invitation. Please don’t say no,” he added for all the artists out there. Musk described Maezawa as ‘incredibly brave’ for embarking on this mission, adding that his desire to participate in and pay for this trip restored Musk’s faith in humanity. The mission is slated to launch as soon as 2023, though Musk said he can’t be sure about that timeline yet as “things do not go right in reality” and that “usually there are setbacks and issues”. The BFR is also getting some changes to its design, Musk revealed alongside Maezawa’s participation on the mission. The rocket will be 387 feet (118 meters) tall, a full 40 feet (12 meters) taller than previous versions. It’s also going to receive front actuator (steering) fins, as well as three back wings to function as landing pads. The system’s spaceship is expected to carry up to 100 people and 150 tons (136 metric tonnes) of supplies. The first portion of the system has already been built, Musk added. Total development costs for the rocket fall somewhere between US$2 billion and US$10 billion. SpaceX did not reveal any exact figures on how much Maezawa paid for the lunar flight, only that it as a significant sum and that a down payment has already been made.